Translucent dividers provide a modern design for organizing professional presentations with a flare. Plastic dividers look good even after heavy use. I have been using the Index Maker Clear Label Dividers with the Easy Peel Strips for our company presentation binders for quite some time now. They are a real time saver when it comes to making various sets of dividers. Having the option to label the front and back of the tabs is great! You can be as creative as you want with the design tool that allows you to import an image (such as a company logo) from a clip art gallery. Everything from the ease of labing all the tabs at once to the clear labels giving a printshop quality look allows me to create a professional and impressive project! I use these at all times - easy to use/format and always resulting in a professional product. Avery Index Maker Clear Label Dividers. Needs custom Divider in a hurry? It's quick and easy to create professional quality dividers right from your desktop with Avery Index Maker Clear Label Dividers. Printshop Quality, Durable and Easy; Give your presentation, client binders, reports and office manuals professional look with durable Avery Index Maker Clear Label Dividers. It's easy to put together projects of all sizes quickly, or make last-minute changes in a snap. Dividers can be customized with content, color and graphics. Clear label virtually disappear when applied to divider tab so your text and graphic pop. Tabs can be labeled on both front and back for easy reference. Durable tabs resist tearing and stand up to frequent use. Print, Peel and Press; Only Avery offers Easy Apply Label Strips that save you time by helping you label all your divider tabs at once. Just print your label. Remove the label strip. Place and align the labels across your tabs dividers. Press to apply labels to all tabs at once. Then simply peel the strip and you're done. Each strip holds a complete row of labels for your tab dividers so it's easy to create multiple note quickly and efficiently just peel apply and repeat. 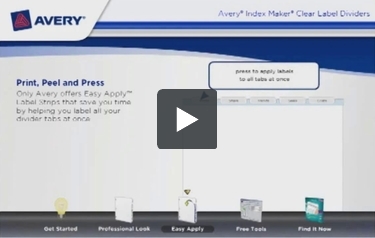 Avery Auto-Fill Templates; Format and customize your Avery Index Maker Clear Label Dividers using free Auto-fill templates available on Avery.com. First find the template that matches your product and click to download. Select the number of sets you wish to create. Check the box if you want to create labels for both the front and back of your tabs. If you like add an image that will be applied to the tabs, such as a business logo. And to your tab text in the field on the right, then click OK. Preview your project and print. Find it now; Efficient solution for busy lives. Count on Avery for products and tools that make it easy to get professional results every time. Available in 3-tabs, 5-tabs, 8-tabs and 12-tabs sets, and white and a variety of colors.